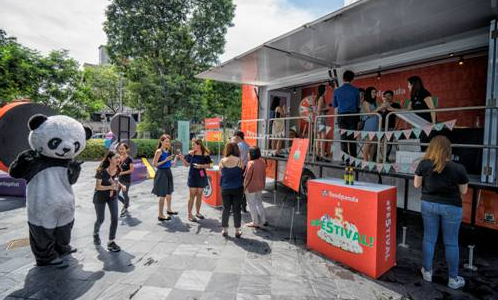 foodpanda celebrated its fifth anniversary with the launch of an out-of-home (OOH) activation campaign held outside Raffles City and Century Square to attract lunch and dinner crowds. Titled #FE5TIVAL!, the campaign ran from 2 May 2017 to 5 May 2017 on XCO’s OptiMax trucks. The campaign was aimed at PMEBs and heartlanders by transforming the OptiMax trucks into mobile food kiosks. New users were encouraged to download the foodpanda app while rewards were given out to existing users. According to the press statement, the mobile food kiosks allowed foodpanda to bring its festivities to multiple locations, further enhancing the experience customers have with the brand”. XCO, a subsidiary of SMRT Commercial, worked with Mojito, an event agency, for the campaign launch. “Through this activation with XCO using their OptiMax truck, we rewarded our existing customers with prizes and reached new customers to let them know about our service and drive app downloads,” Cindy Layardi, foodpanda’s senior marketing manager said. She added that the company found the OOH campaign effective as it enabled foodpanda to increase brand visibility to young Singaporeans in the CBD and heartlands, both of which have high footfalls. In 2016, foodpanda was acquired by rival Delivery Hero, a Germany-based food takeaway company. Both food-delivery companies are backed by German e-commerce firm Rocket Internet. foodpanda also renewed its partnership with Text100 Hong Kong last year. The Health Promotion Board is looking for a new public relations agency in its latest review, putting incumbent Waggener Edstrom o.. The global online marketplace for authenticated pre-owned luxury and premium fashion, today revealed a new branding campaign with ..